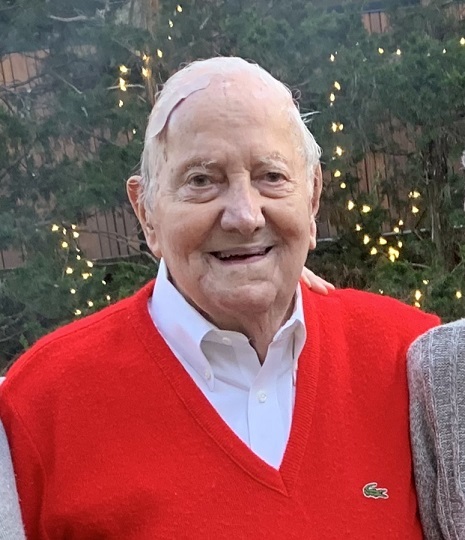 Samuel William Harden, 92, of Overland Park, Kansas, passed away in the comfort of his home surrounded by family on Saturday, April 6, 2019. Sam is survived by his wife of 68 years, Minnie, their children; Eli (Donna) Harden, Kevin (Brenda) Harden, and Karen (Clay) Miller. Grandchildren who will miss Sam include Emilie Miller (Steve) Young, Andrea (Clark) Shadrach, Ethan Harden, Brenden (Jessie) Miller, and Melissa Harden and great grandson, Thomas Harden Shadrach. Sam was born on August 19, 1926 and adopted by James B. and Charlotte C. Harden (Simpson) of Kansas City, Missouri. He enlisted in the U.S. Navy in August 1943 on his 17th birthday and received an Honorable Separation approximately 4 years later in September 1947. During his time in the service, among other duties, Sam served on the USS Corregidor CVE 58 in Fleet Admiral William “Bull” Halsey Jr.’s Pacific Fleet. During his civilian life, Sam worked as a welder and Plant Superintendent for steel and conveyor manufacturers in the Southwest Boulevard and Fairfax districts of Kansas City, Kansas. Sam loved the times he spent fishing and was still telling fishing stories until the time of his death. He also treasured the times he and Minnie joined their friends traveling to various places across the US in their RV. In honor of his service to our country, services will be conducted at Leavenworth National Cemetery at 10am, 15 April 2019 in Leavenworth, Kansas. In lieu of flowers, memorials are suggested to Kansas City Hospice or the American Cancer Society. Online condolences at www.parklawnfunerals.com. In honor of his service to our country, services will be conducted at Leavenworth National Cemetery at 10am, 15 April 2019 in Leavenworth, Kansas. We are so sorry to hear of your loss. Warm wishes for you all. Please accept our deepest condolences. Our prayers and thoughts are with the family. Karen and Family, We are very sorry for your loss. Our thoughts and prayers are with you. Dear Eli and family, My heartfelt sympathy to all of you on your father's death. What a long life well-lived! May the many memories you share give you comfort. To Eli, Kevin and Karen, there of course are no words that can express my love for your Dad and your family. My oldest and dearest memories are surrounding your family and mine, the fun times we had and the love we all shared. I am so sorry for the loss of this dear man, your Dad was a wonderful guy, a mentor to me, and a dear friend to my Dad and Mom. My heart is full of love for you all. My deepest love to Minnie.